With new dice, new projects, and new cast members, the Hexes & Bows Podcast is ready to surprise attack 2018! We’re beyond thrilled to be recording and sharing our geeky content with you and cannot thank you enough for your continued support. We sincerely hope the winter holiday season kept you in good spirits and, perhaps, introduced you to new games! We’ve got lots of updates to share in this episode including some details regarding our actual play podcast, a new podcast release schedule, and a brand new cast member! After the announcements you’ll find an excellent discussion about the impact of playing board games as a child may have impacted our lives as adults, sharing the love of tabletop gaming by introducing the hobby to family, how gamers can be involved with local communities and promote gaming in a positive light, and of course, Overwatch. Because… Overwatch (GO DYNASTY!). How do you think gaming (tabletop) has influenced your life, especially if you were introduced to the hobby at an early age? Do you run/host/create tabletop gaming events for your community (after school programs, nursing homes, charity…)? If so, share with us the details! Thank you so much for helping us make Hexes & Bows in 2017. Your support, kindness, and love of gaming continue to motivate us in improving the show for you. We can’t wait to share all of our new projects with you and we hope you enjoy them as much as we enjoy creating them! Keep the Conversation Going: Connect with us on social media for more tabletop talk! Is this a podcast or an interview? Not really sure, but it was an absolute pleasure having Gnome chat tabletop gaming with the host of Tales from the Fandom podcast, David Ginsburg! David interviews different guests from every fandom imaginable on his podcast, so Gnome flipped the table and turned the questions on him! 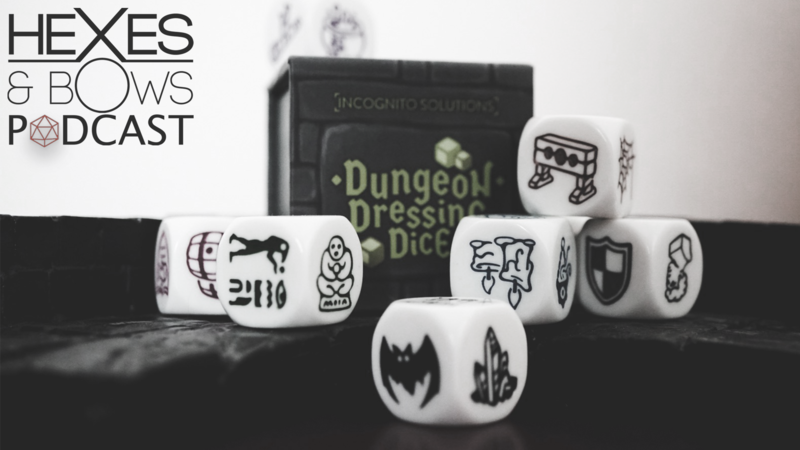 Learn about David’s favorite fandoms, his passions and experience in tabletop gaming, upcoming actual-play podcasts, now-successful Kickstarters, old school role-playing, and much more! Our question to you is: do you roleplay? Have you roleplayed? What got you into roleplay? Is it something that you discuss publicly? We’d love to hear your experience regarding this! Let us know in the comments or on Twitter!